Edraw Mind Map is an effective freeware which used to represent notes, memory, learning, think creatively, associate ideas, tasks, or other items linked to and arranged around a central key word or idea. A professional version Edraw Max can create more drawing types and enhance your creativity, improve the business and make connections that you might not otherwise make. Many words in normal writing are padding, as they ensure that facts are conveyed in the correct context, and in a format that is pleasant to read. In Mind Maps, single, strong words and short, meaningful phrases can convey the same meaning more potently. Excess words just clutter the Mind Map. Topics do automatically connect when you drag them from the Mind Shapes library. So you need not to connect topics one by one. To begin, drag a Mind Shape out onto the drawing page. The smart guide will show like the following image. You can type the text on the face of this mind map symbol to refer to something that makes sense for your business. 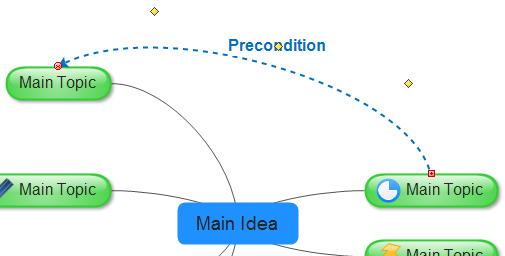 In Mind Map, images behave in much the same way as mind map symbols do. You can insert a picture from file folder or use the clip art in Edraw library to get a clear picture of your workload and view each task objectively. By dragging the picture to a mind shape, the picture will be added into the shape like a symbol. This is an excellent way to add visual impact to your diagrams. Surprisingly, Edraw Mind Map even lets you create tables. It's an important function for users to do a statistic for mind map symbols. Move the pointer to select the number of rows and columns that you want, and then click. Click Insert Table, and then enter a number in the Number of columns and Number of rows lists. Information in one part of a Mind Map may relate to another part. Here you can draw lines to represent the relationship. This helps you to see how one part of the subject affects another. 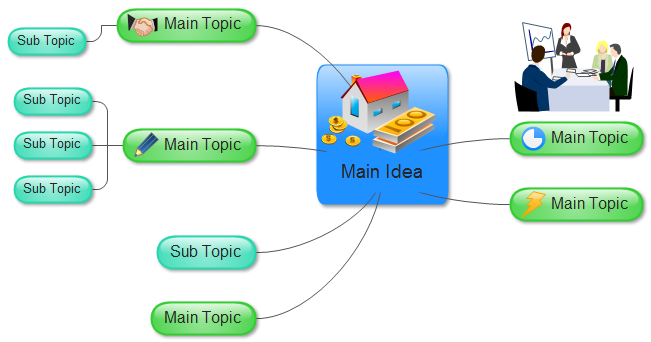 The Insert Relationship tool illustrates a special relationship between two topics or subtopics in your mind map using an Association line which appears as a dashed line between associated topics. 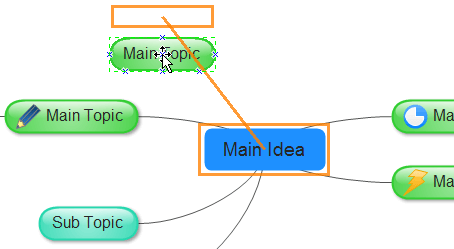 For a mind map, Edraw contains an amazing depth of features. 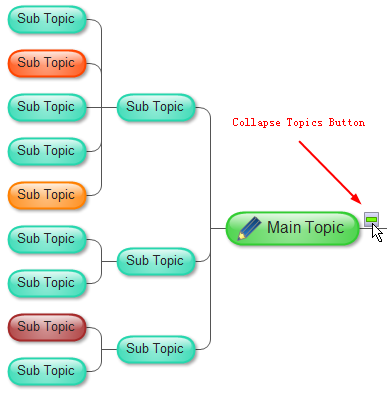 Using an Arrangement Direction sub-menu within the Mind Map menu, you can even make changes of topic layout by one click. You can also change the connection style to arc, line, elbow or curve. The following image changes a map to Hierarchical layout. A good way to avoid a too big mind map is to create a separate Mind Map with a main topic on a new page. Then build subtopics from the main topic and use the hyperlink to navigate. With the Edraw software, you can even copy and paste topics between different page as you schedule them to be done so that you are left with a clear picture of what is left to do. There is no need to start again or re-draft your maps so you can save even more time. You can show and hide the topics of different levels in your additional map using the Expand and Collapse buttons. It's very effective for the big size mind map. Graphic format: transparent *.png, *.bmp, *.jpg, *.svg. Document format: *.doc, *.docx, *.pdf. Data format: *.cvs, *.xls, *.xlsx, *.txt. Mind mapping (or brain-storming diagram) involves writing down a central idea and thinking up new and related ideas which radiate out from the center. By focusing on key ideas written down in your own words, and then looking for branches from and connections between the ideas, you are mapping knowledge in a manner which will help you understand and remember new information. Look for relationships - Use lines, colors, arrows, branches or other ways of showing connections between ideas generated on your mind map. These relationships may be important in understanding new information or in constructing a structured essay plan. By personalizing the map with your own symbols and designs, you will be constructing visual and meaningful relationships between ideas which will assist in your recall and understanding. Draw quickly on unlined paper without pausing, judging or editing - All of these things promote linear thinking and the idea of mind mapping is to think creatively and in a non-linear manner. There will be plenty of time for modifying the information later on. But at this stage, the most important thing is to get every possibility into the mind map. Sometimes, it is one of those obscure possibilities that may be the key to your knowledge of a topic. Write down key ideas- Some students find that using capital letters encourages them to get down only the key points. Capitals are also easier to read in a diagram. You may, however, wish to write down some explanatory notes in lower case. Some students do this when they revisit the mind map at a later date while others write such things as, assessment criteria, in this way. Put the main idea in the center - Most students find it useful to turn their page on the side and do a mind map in "landscape" style. With the main idea or topic in the middle of the page this gives the maximum space for other ideas to radiate out from the center. Leave lots of space - Some of the most useful mind maps are those which are added over a period of time. After the initial drawing of the mind map you may wish to highlight things, add information or add questions for the duration of a subject, right up to exam time. For this reason, it's a good idea to leave lots of space.